During the last week’s Google + event, a few new features to Hangouts were announced. Some of the most awaited were related to locations sharing, animated gif support in chats and SMS messaging support. Today, the new version of Hangouts available in Google Play includes, among other features, the possibility to send and receive text messages. In general, the text experience in any device is similar to the one shown for the Nexus 5, and every time you start a new conversation you could choose to do it through Hangouts or SMS. The installation on your device is quick and easy. When you install the updated Hangouts version, you will be asked about your preferences about the SMS support. If you want the option enabled, just choose it and your text messages will be managed through Hangouts app. You can change this option at any point, just go to Settings and choose “Turn on SMS” on the SMS menu to enable or disable SMS. Another feature included in this Hangouts 2 version is a new location-sharing button to let your contacts know where you are. In addition, the version also incorporates the possibility to add animated GIFs. This announcement has followed the release of the new KitKat keyboard to Google Play. 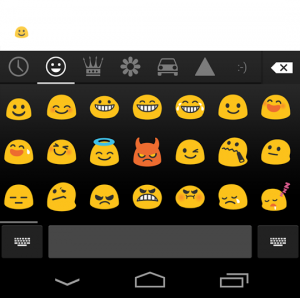 The Google Keyboard’s update includes the latest KitKat features for any Android 4.0 or above. In this version, the swiping trail is white, the emoji are included and users can swipe multiple words without lifting up their finger. As a new feature, Google Keyboard rationalizes punctuation across the different sizes (4, 7 and 10 inches) and inserted emoji entry point and layouts, although this is only available for Android KitKat. The upgrade also simplifies mini-keyboard on full stop long press and added space-aware gesture typing. The idea is that by moving your finger on the screen without lifting it from the display, you can gesture typing.